Cuthbert Malajila scored the first goal of the game on 27 minutes, heading home Dove Wome's cross. Camaldine Abrew levelled just after the break after a well-worked move, but Moriri got the decisive strike with four minutes remaining, controlling Malajila's pass before slotting home. The game started off slowly with both sides struggling to break down the opposition’s defence, meaning both teams were limited to long-range efforts in the opening 10 minutes. 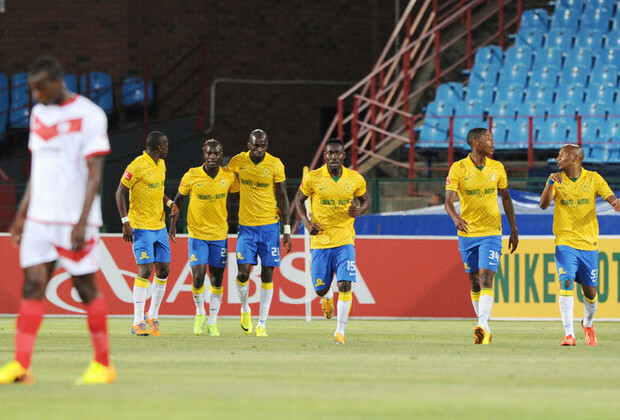 Downs captain Alje Schut almost broke the deadlock in the 13th minute, rising highest to meet Hlompo Kekana’s free-kick, but his effort went wide. Malajila always looked the most likely to score for the Brazilians, and he did just that in the 27th minute; the Zimbabwean losing his marker before nodding a precise Wome corner-kick past Daniel Agyei. Downs continued to press and Wome nearly doubled their tally with a freak goal two minutes before the break. The Togolese midfielder’s curling corner-kick had Agyei beaten, but not the post. However, Ea Lla Koto came out a different side in the second stanza and levelled matters in the 52nd minute through Abraw. Mongezi Bobe made a driving run down the right flank before playing into the path of the Togolese striker, who tapped in for the equaliser. Free State Stars dominated proceedings in the second stanza and should’ve taken the lead, but poor decision making let them down. Substitute Basit Adam was especially guilty of trying to beat the whole Brazilian defence on his own when he had a teammate completely unmarked. And Moriri punished Stars for failing to take their chances four minutes from time. Malajila picked out the veteran from a quick counter-attack, and he took he took the cross down superbly before guiding his effort into the back of the net. The goal made for a tense final few minutes, but the Brazilians held on to move to the summit of the table, while Stars drop down to 14th place.